Olivia and Liam were Alberta’s most common baby monikers in 2018, while Harper, Elizabeth and James cracked the top 10 list for the first time in decades. 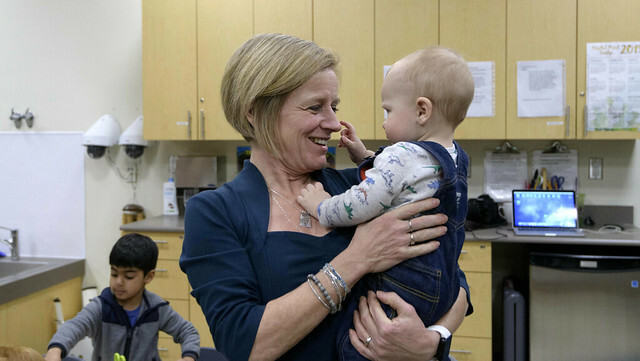 Premier Notley announced Alberta’s top baby names for 2018 and addressed recent changes to the midwifery profession at Mount Royal University. Alberta welcomed 50,104 babies into the world last year – 25,717 boys and 24,387 girls. Olivia was the most popular name choice for baby girls for the fifth year in a row, with Emma and Charlotte close behind. Liam has reclaimed the top boy’s name in Alberta, taking the No. 1 spot back from Noah. Noah dropped from first to third place in the boys’ names list, while Oliver jumped to the second most popular name spot. Service Alberta recorded 13,363 different baby names in 2018. From popular culture to nature, parents found name inspiration from a variety of sources. Some of the more unique names appear to be inspired by Marvel comics (Loki, Thanos, Captain), Star Wars films (Kylo, Leia, Anakin), books from the Bible (Genesis, Exodus, Leviticus), places (Ireland, Chicago, Venice), outer space (Galaxy, Jupiter, Moon) and gemstones (Amethyst, Sapphire, Onyx, Diamond). This year, more expectant parents than ever before chose a midwife to help support them before and after their baby was born. Of the more than 50,000 babies born in Alberta in 2018, nearly 3,600 parents received the support of a midwife, up from 2,400 three years ago. Midwives serve families with low-risk pregnancies. Care starts during pregnancy and continues after birth. As part of Budget 2016, an additional $11 million was allocated for midwifery services over three years, for a total of $49 million. The Government of Alberta also expanded midwives’ scope of practice, so they can prescribe, dispense and administer a broader range of prescription drugs, use ultrasound to determine fetal position, administer vaccines and insert intrauterine contraceptive devices. This brings the scope of practice for Alberta midwives in line with many other provinces and territories. Oliver climbed six spots to become the second most popular boys’ name. James cracked the boys’ top 10 list for the first time since 1983. Harper and Elizabeth appeared in the girls’ top 10 list for the first time since records began in 1980. Tied names mean there are 12 names on the boys’ top 10 list, with Logan and Lucas both in the fifth spot, and Alexander and James tied for spot No. 10. Parents have up to a year to register their children’s births. As a result, 2018 baby names lists and birth statistics may change slightly. Albertans can look up more than 95,000 names dating back to 1980 through the Alberta Baby Names App, available for free download on iPhone, iPad and Android devices. Baby names statistics are recorded by the Vital Statistics branch of Service Alberta, and are based on the registration and notice of birth information. A complete list of names is available on the Open Government Portal.